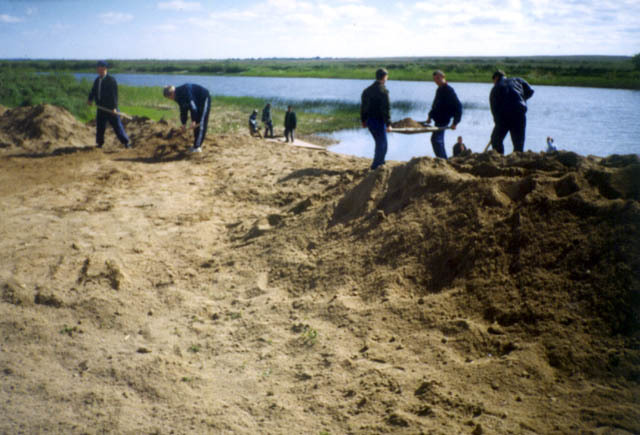 Project:"Eco-Minded Youth to Clean up Beach on the Zhabai River in Atbasar, Kazakhstan"
Organization characteristics: There are 11 core members and 78 volunteers in the organization. 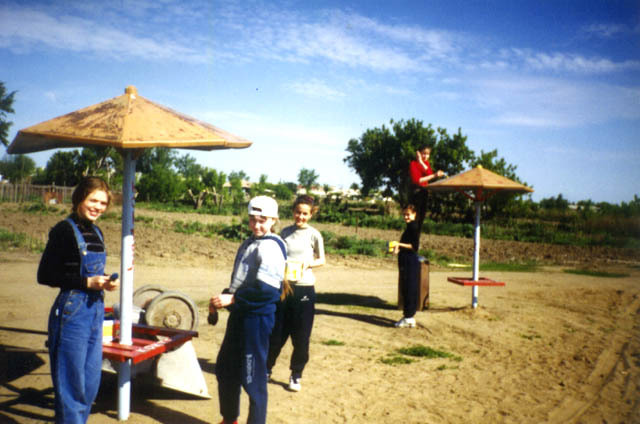 When we received financial support for realization of our project, we began the preliminary activities on cleaning of the local beach on the Zhabai River. Firstly, we met together with the representatives of governmental organizations and local mass media. We told them about our project and then distributed prepared leaflets with information about the issue and showed the film about the work done on the beach in the previous year. Afterward, we informed them about the financial support of the Virtual Foundation and on which activities the money is going to be spent. During the discussion very important initiatives were created. The leaders of several government organizations joined in to assist us. The Head of the Environment Protection Department, I.U. Zholdash, promised to deliver about 100 tons of sand. The Chief of the regional Hospital, V.I Bransev, distributed information among the local citizens on sanitation. The Chief of the Inspection on the matters of the minors, A.A.Prohorovoy, provided us with the participation of young offenders. The Director of the Culture Department of Atbasar region organized the ceremonies for the newly opened beach. Moreover, the head of the Emergency Response Corps, V.I. Svidzinskiy, assisted with equipment and volunteers, the editor of the newspaper "Prostor", B.Z. Isabekova, helped with news coverage of our activities, and the entrepreneur T.D. Temirbulatov supported our project financially (he sponsored soft drinks, paints and brushes). The mayor of the town, V.G. Baklan, recommended that we order the beach equipment from the "Krasnaya Zariya" factory. .I must note that everything promised was done very well and on time. The director of the "Krasnaya Zariya" factory offered a matching donation from his organization, equal to the amount that we spent on the acquisition of the hatch. In addition, he supplied two more metal cloakrooms, two toilets, trashcans, a metal arc preventing the entry of trucks, and the posts for the fence. All this equipment was set up on the beach and painted brightly by the volunteers. Before starting the beach was cleaned up properly. We made the layout, cut down tall weeds and cleaned all the paths to the beach. Next, the participants started to distribute the newly delivered sand. During the work, children from the club's press center and video studio were taking photos and video materials as well as the poll among the participants and Atbasar citizens. The beach was ready for the presentation and the opening of the swimming season by the 4th of July devoted to the World Day of Environment Protection. Almost everyone accepted our invitations to attend. There was a wonderful concert. About 140 of our student participants received letters of gratitude and copies of "Ogonek"-Kazakhstan magazines. In other words, it was clear that local society is willing to help the environment and is always ready to assist the young ecologists. After the renovation the beach became the most visited place during the summer. Finally, we again met together in order to make conclusions and for providing monitoring of the project. We presented the financial report, and showed the film and photos. Everybody was satisfied with the results of all the work that has been done. At the same time this action raised the image of environment protecting organizations in the eyes of our governmental and private agencies. 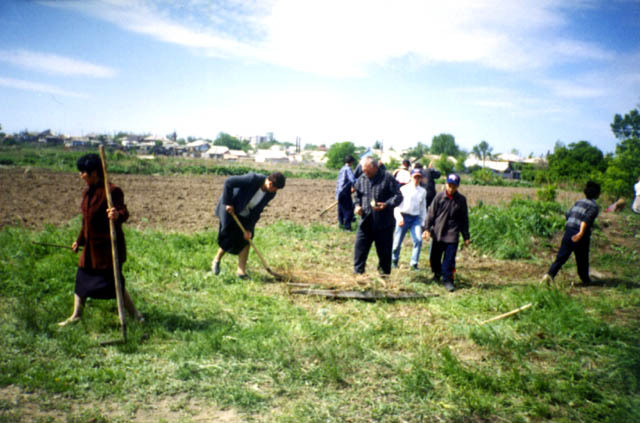 According to a resolution of the Atbasar town council, the work of SSW (Society of Saving on Waters) was resumed. Moreover, the job of "beach rescuer" was created; the regional bacteriological laboratory service examines the river water every 10 days and regularly informs people about the results. For the future, businessmen have plans to open a café on the territory of the beach. In the autumn we are going to plant a willow park and then to close down the beach till the next season. What is more, the Deputy Mayor of Atbasar region, L.I. Bobrova, made a proposal to hold a ceremony at the beach for the Day of Neptune, coinciding with Navy Day. We are grateful to the students and teachers of the Upper Mohawk Valley Model United Nations Conference of 1999, the Virtual Foundation and ISAR - Central Asia for the trust and opportunity to hold such an important event. Hope you will support our further projects.